The California senator is a potential 2020 presidential candidate. Sen. Kamala Harris, who is considering a 2020 presidential campaign, opened up Tuesday about the influence her late mother, Shyamala Gopalan Harris, had on her life, saying that she was empowered to take personal action to fix problems she encountered -- a theme that she says is impacting her political career. "I was raised that, when you see a problem, you don't complain about it, you go and do something about it," Harris, D-Calif., said in an exclusive interview on "Good Morning America." "My mother -- I would get so upset at her when I got older. I would come home with a problem, other parents would say, 'Oh, darling, I'll take care of it.' My mother, the first thing she would do, she would look at us and she'd say, 'Well, what did you do?'" the senator recalled. "So I think this is that moment." Harris said her mother is the "star" of her two books being released this week, the memoir "The Truths We Hold: An American Journey" and the children's book "Superheroes Are Everywhere," and that the well-being of her family was her focus as she continues to contemplate a presidential run. During both her "Good Morning America" interview and a later appearance on "The View," Harris demurred when asked if she had reached a final decision on running, saying she wasn't quite ready to make an announcement. She did not hesitate, however, when responding to a question about whether the nation was ready for a woman of color such as herself to be president. "Absolutely," Harris said, adding, "We need to give the American public more credit ... we have so much more in common than what separates us." Harris also commented on the ongoing partial government shutdown, rejecting the president's claims that Democrats were to blame for the impasse and calling President Trump's proposed Mexican border wall "a vanity project." "It's an emergency of his own creation," she said, noting that hundreds of thousands of federal workers remained furloughed or without pay during the shutdown. Should Trump move forward with his border wall and institute a national emergency declaration for its funding, Harris said there would be litigation. "These are moments in our country where the beauty of the design of our democracy is being tested," she said. "If you think about our democracy or the republic as being a tabletop standing on four legs, there are three independent, coequal branches of government and a free and independent press … those other branches of government and the courts and the press will put the checks and balances on the outrageous conduct of this administration." (KC McGinnis/Reuters) California Senator Kamala Harris speaks at a Polk County Democrats event in Des Moines, Iowa, Oct. 22, 2018. Elected to the Senate two years ago, Harris has drawn comparisons to former President Barack Obama for her rapid rise to national prominence and her consideration of a presidential campaign after only a brief time on Capitol Hill. Prior to her Senate election, Harris served six years as California's attorney general and seven as San Francisco's district attorney. 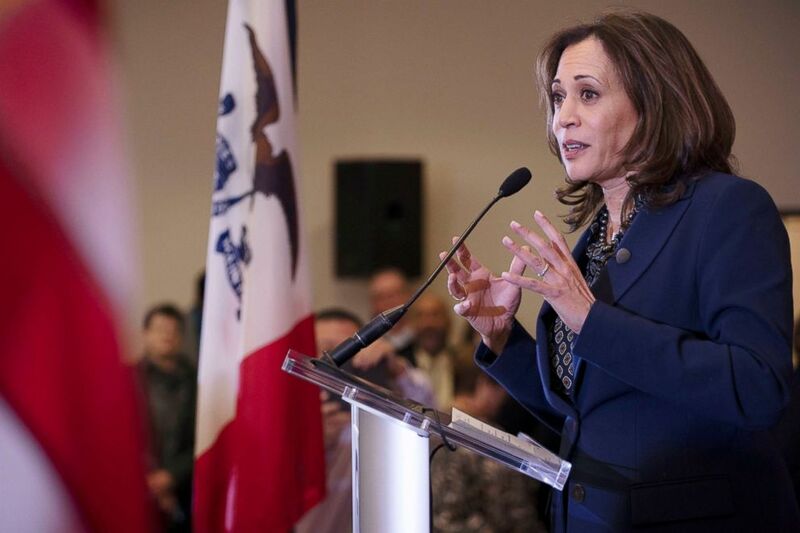 In October, ahead of last year's midterm elections, Harris traveled to Iowa to stump for Democratic candidates -- a visit widely viewed as the senator's first unofficial foray into the presidential campaign. In early polling featuring potential presidential candidates, Harris has generally landed within the top tier of contenders. Two CNN polls -- one conducted nationally and one of likely 2020 Iowa caucus-goers conducted in conjunction with the Des Moines Register and Mediacom -- showed Harris with 4 percent support and being named as the first choice candidate of 5 percent of respondents, respectively, among a crowded field. In 2018, the senator played a significant role during the closely watched confirmation hearings of now-Supreme Court Justice Brett Kavanaugh. A member of the Senate Judiciary Committee, Harris said she believed Christine Blasey Ford's testimony and called Kavanaugh "unfit" to serve on the Supreme Court. "The Judge Kavanaugh the American people saw before the Judiciary Committee does not have the character, the temperament, or the judgment to sit on the highest court in our land," Harris said in a statement following Kavanaugh's confirmation. "His own partisan, evasive, dishonest, and aggressive testimony demonstrates that we cannot trust him to be a fair and unbiased jurist. He is simply unfit. The Senate should have put partisanship aside and demanded better."